The Use of Force in Criminal Justice addresses the how, why, and when of utilizing force against citizens in a democracy. 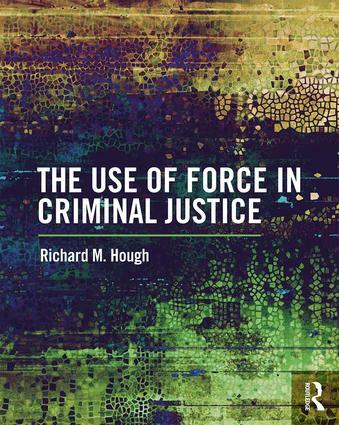 This is the first true textbook on this topic, offering students and instructors a balanced, research-based approach to understanding the use of force in law enforcement, as well as in corrections and juvenile justice. Hough includes features to reinforce key concepts, including "What-Why," "Try This," "Going Global," and "Research Results" boxes. Richard M. Hough is a faculty member in the Department of Criminology and Criminal Justice and is the Coordinator of the Public Administration Program in the Department of Legal Studies, Public Administration, and Sport Management at the University of West Florida. For more than 25 years Dr. Hough has taught criminal justice and public administration courses dealing with the practices and policies of criminal justice personnel for undergraduate and graduate students. As an instructor of defensive tactics, he has taught physical control and defense techniques and force concepts to law enforcement and corrections academy recruits and in-service officers for more than 30 years. Dr. Hough regularly consults as an expert witness in force usage and police and corrections practices in federal and state courts, and has done so for 25 years.